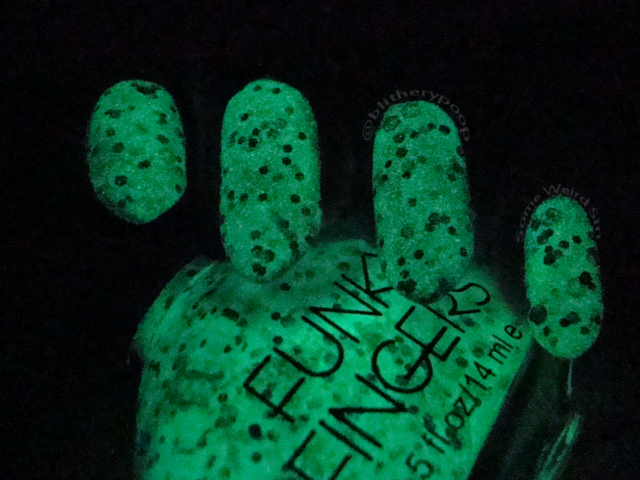 Some Weird Sin: Funky Fingers R U Afraid Of The Dark? R U Afraid Of The Dark has a dusty blue base, matte black and green glitter in various sizes, and a green glow. The green glitter glows more than the base under blacklight, and the base still looks bluish. Mindblowing! I was so thrilled with it that I showed Player 4 and he went "WOW!" Such a bright glow from a darker polish is really unexpected and impressive. Another instant favorite! Bottom line: Very very yes!